Discussion in 'Ancient History and Mythology' started by juantoo3, May 9, 2017. A tutor on my theology course said the Christian Tradition is a shift from mythos to logos. Sounds nice, but not sure I agree. My reasoning is how so much of Christianity either borrowed from or layered over established pagan mythos. Hard to hear I'm sure, but even simply looking at the missionary norm of keeping a great deal of local traditions and customs and giving them Christian "spin." Then there's the old standbys, Christmas and Easter to point to. That is an interesting article, to be sure, but I couldn't help but think it was slanted from one side instead of being omnidirectional. Forgive me, but it seemed like it had an agenda to support, one I don't particularly agree with. I grew up on the poor side of town in the third largest city in the USA, and didn't have two nickels to rub together growing up. I understand what the article is saying, but the choice to surrender to hopelessness lies firmly on the individual. I had my fling with illicit drugs, never deeply and over time it lost its charm. I am also disabled, recognized by the state and nation, yet I continue in gainful employment - by choice. I've had a number of people point to me as a role model, to which I immediately stop them and say, I am no role model...I'm just another guy trying to make my way through life so I can *have* a life. I could easily have surrendered my will and autonomy to the state and lived off of disability checks, for the rest of my life. I could have sat around smoking pot and watching tv or playing video games...what kind of life is that? Enough for some, I'm sure. Not for me. I am still capable, just no longer with my body. I still have a mind, and that mind can still contribute to society. In that sense only, perhaps I am a model...I would rather be a giver than a taker. Because of my experience, I have little patience or sympathy for those who wish to live off of the government dole. There are exceptions, someone profoundly mentally challenged, for example. Wounded veterans who serve in the cause of one's nation certainly deserve assistance. But I have no sympathy for those who have discovered that with checking the right boxes on the ticket, it is a free ride to couch sitting and high times. A lot of the current attitude is brought about by the government promoted zeitgeist of "vote for us and we'll give you everything, equally." There is nothing in nature that guarantees equality. There is nothing in nature that guarantees you will eat if you do not put forth effort. Perhaps it is an American and Aussie thing, the self determination attitude, the "can do" spirit. But it is steadily eroding here, and it sounds like the entitlement attitude is firmly entrenched there and I understand in other parts of Europe as well. Outside of the first world, this entitlement attitude is foreign, not to mention just plain strange...and certainly nothing to do with any example found in nature. Seems I got the bottom two rungs backwards, I was putting safety before food and shelter. Be that as it may, the social needs would have been met by the tribe. Esteem would effectively be the same as the bull male lording himself over his harem, and the alpha female keeping the other females in line...which really is evident in any pack animal situation. I still don't see a correspondent to "self-actualization," I'm fairly convinced that's a more recent psychological development. 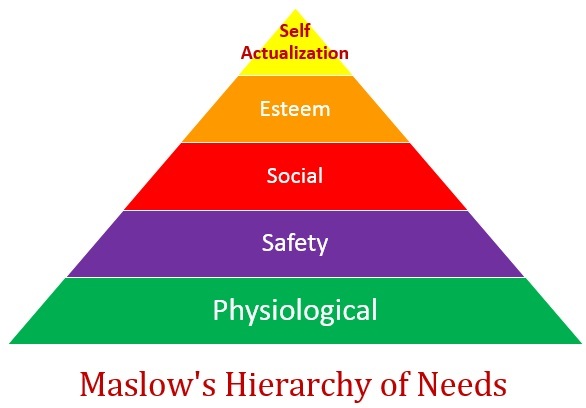 Even Maslow pointed out that self actualization is a level seldom attained, and even then it is only briefly. Prior to the finds here, it was largely presumed that humans fled Africa, and some stragglers stayed behind and populated the continent while the rest escaped elsewhere (the Levant and points East, with a few branching North and West). Turns out, humans may have developed considerably further mentally in the South of the African Continent, and from there spread out. Blombos is proving a very fertile site for excavation, and dating twice as old as some of the oldest sites in Europe (100k v 41k +/-). Red Ochre with carvings, dated at 75k ybp, along with carving tools, from Blombos. Red Ochre was a universally used decorating material found in a wide variety of stone age settings, from cave murals to burials. Link to a scholarly paper regarding Blombos, in particular the now 64 or so carved shell "beads." I believe there to be one more level... Beyond self..
Perhaps, once we are no longer fettered by our animal nature. If one could part the veil, one could ask Maslow. My reasoning is how so much of Christianity either borrowed from or layered over established pagan mythos. Not so sure. The practice of incorporating pagan traditions began around the sixth century, on the basis that such traditions like Halloween are founded in nature and a 'pagan' comprehension, so they saw it as 'baptising' them. Prior to that, the Christianity was quite militant in opposing pagan practices. Then there's the old standbys, Christmas and Easter to point to. Well the latter derives from the Hebrew calendar, and the Hebrew mystical workings of the former have been rehearsed here more than once. I personally think that opinion doesn't really stand too much interrogation. That is an interesting article, to be sure, but I couldn't help but think it was slanted from one side instead of being omnidirectional. I grew up on the poor side of town in the third largest city in the USA, and didn't have two nickels to rub together growing up. Same here. My father came from a rural background, as the poverty of his childhood was way worse than mine. I understand what the article is saying, but the choice to surrender to hopelessness lies firmly on the individual. Not so sure on that, but it's a whole other discussion. I actually agree with you, on the whole. A lot of the current attitude is brought about by the government promoted zeitgeist ... and certainly nothing to do with any example found in nature. Preaching to the choir, chum! But I am regarded as an old fart for holding those views. I flagged it because McGilchrist discusses the 'removal' of natural forms contributes to the left/right thing ... I'll try and dig out the relevant comments. Well the latter (Easter) derives from the Hebrew calendar, and the Hebrew mystical workings of the former (Christmas) have been rehearsed here more than once. I personally think that opinion doesn't really stand too much interrogation. As for Christmas, there are echoes that go back even further, as I know you and I have discussed in the past concerning the Wild Man tradition, which later incorporated the Greene Knight. The virgin birth on December 25 specifically comes straight out of Mithraism. Even Matthew points out the shepherds were in the fields with their flocks....it snows in the Holy Land, they would have come in from the fields before December. At Nicea some elements of paganism were officially sanctioned...Sunday Sabbath as a start, reserved to that time for worship of the Sun Deity, hence the name for the day. I agree other elements of paganism began to be set aside, but it didn't happen overnight. It took a few generations before paganism was formally outlawed in favor of Christianity. I believe it was under Justinian that such practices as sacrifice to the various Roman and Greek gods was officially outlawed. The Catholic church specifically, in its missionary outreach, was typically quite accommodating to those it brought into the fold. Some examples off the top of my head are the mosh of Voodun and Catholism in Haiti, and the veneration of the Virgin of Guadalupe in Central America. These are merely examples, with a few minutes worth of digging I can find a lot more to demonstrate. Many of these incorporated practices are distinctly unchristian in appearance to the typical run of the mill Christian. Practices such as animal sacrifice in the case of Voodun and others whose name I've forgotten in the southern border region of Turkey, or renaming of local "place" gods after the Apostles which are still prayed to in the previous manner with "new" (relatively) names. Should be educational to see. I thought for sure he was speaking of Christmas and Easter...yule logs, trees, wreaths, solstices, etc..
"Since 1991, excavations at Blombos Cave have yielded a well-preserved sample of faunal and cultural material in Middle Stone Age (MSA) levels. The uppermost MSA phase, M1, is dated to c. 75 ka by optically stimulated luminescence (OSL) and thermoluminescence, and the middle M2 phase to a provisional c. 78 ka. Artefacts unusual in a MSA context from these phases include bifacial points, bone tools, engraved ochre and engraved bone. In this paper, we describe forty-one marine tick shell beads recovered from these MSA phases and tick shell beads from Later Stone Age (LSA) levels at Blombos Cave and the Die Kelders site. Thirty-nine shell beads come from the upper M1 phase and two from M2. Morphometric, taphonomic and microscopic analysis of modern assemblages of living and dead tick shell demonstrate that the presence of perforated Nassarius kraussianus shells in the Blombos MSA levels cannot be due to natural processes or accidental transport by humans. The types of perforation seen on the MSA shells are absent on modern accumulations of dead shells and not attributable to post-depositional damage. Their location, size, and microscopic features are similar to those obtained experimentally by piercing the shell wall, through the aperture, with a sharp bone point. Use-wear, recorded on the perforation edge, the outer lip, and the parietal wall of the aperture indicates the shells having being strung and worn. MSA shell beads differ significantly in size, perforation type, wear pattern and shade compared to LSA beads and this eliminates the possibility of mixing across respective levels. Thirty-one beads were found in four groups of five to twelve beads, each group being recovered in a single square or in two adjacent sub-squares during a single excavation day. Within a group, shells display a similar shade, use-wear pattern and perforation size suggesting their provenance from the same beadwork item, lost or disposed during a single event. The likely symbolic significance of these finds suggests levels of cognitively modern behaviour not previously associated with MSA people." "Recent investigations into the origins of symbolism indicate that personal ornaments in the form of perforated marine shell beads were used in the Near East, North Africa, and SubSaharan Africa at least 35 ka earlier than any personal ornaments in Europe. Together with instances of pigment use, engravings, and formal bone tools, personal ornaments are used to support an early emergence of behavioral modernity in Africa, associated with the origin of our species and significantly predating the timing for its dispersal out of Africa. Criticisms have been leveled at the low numbers of recovered shells, the lack of secure dating evidence, and the fact that documented examples were not deliberately shaped. In this paper, we report on 25 additional shell beads from four Moroccan Middle Paleolithic sites. We review their stratigraphic and chronological contexts and address the issue of these shells having been deliberately modified and used. We detail the results of comparative analyses of modern, fossil, and archaeological assemblages and microscopic examinations of the Moroccan material. We conclude that Nassarius shells were consistently used for personal ornamentation in this region at the end of the last interglacial. Absence of ornaments at Middle Paleolithic sites postdating Marine Isotope Stage 5 raises the question of the possible role of climatic changes in the disappearance of this hallmark of symbolic behavior before its reinvention 40 ka ago. Our results suggest that further inquiry is necessary into the mechanisms of cultural transmission within early Homo sapiens populations." "To test these scenarios, it is necessary to identify and date the occurrences of innovations that may signal the acquisition of modern cultural traits. Symbolic material culture, representing the ability to share and transmit coded information within and across groups, is an indication of modern cognition (1, 2, 5, 13, 16–18). This statement is particularly true when the physical body is used as a means of display. Beadwork represents a technology specific to humans used to convey social information to other individuals through a shared symbolic language (17, 19). Until recently, the invention of personal ornaments was considered synonymous with the colonization of Europe by AMH some 40 ka (20, 21). Most now accept that marine shells were used as beads in the Near East, North Africa, and SubSaharan Africa at least 35 ka earlier. Five sites—Qafzeh and Skhul in Israel, Oued Djebbana in Algeria, Taforalt in Morocco, and Blombos Cave in South Africa—have yielded evidence of an ancient use of personal ornaments. Perforated shells from Qafzeh consist of Glycymeris insubrica bivalves (6), those from the following three aforementioned sites consist of Nassarius gibbosulus (Ng) (7, 8) and those from Blombos are Nassarius kraussianus, common in South African estuaries (5). Two other sites, Sibudu Cave and Border Cave, South Africa (9), have yielded less compelling evidence for early bead use. No unequivocal personal ornaments reliably dated to approximately 70–40 ka are documented in Africa and Eurasia (9). Around 40 ka, beads reappear almost simultaneously in both Africa and the Near East and for the first time in Europe and Asia. In Africa they take the form of ostrich eggshell beads and stone rings (2, 5, 9, 22). In Europe they are associated with both Neanderthals and AMH (10, 13, 18, 19) and take the form of dozens of discrete, regionally patterned types (19). In Asia, a dozen Early Upper Paleolithic sites from Siberia have yielded a wide variety of personal ornament types (13) as old as the earliest European Upper Paleolithic (40 ka)." "Evidence presented here contradicts the view that instances of symbolic mediated behavior dated before 50 ka should be discarded due to the paucity of sites with shell beads, provenance, and deficient modifications of the latter, limited dating evidence, and inadequate contextual information. Our results and already published data indicate that marine shells were used as personal ornaments in North and South Africa and in the Near East during the last interglacial. The data presented here raises to at least nine the number of MP sites that have yielded personal ornaments made of marine shells, raises to several dozen the number of recovered perforated shells, and raises to five the number of shell species used. Even if the number of beads recovered at some of the sites from North Africa is admittedly low, behavioral and chronological consistencies suggest the evidence will inevitably grow, qualitatively and quantitatively, to encompass more sites, types of beads, and, possibly, a wider geographic area. The view that these beads represent negligible evidence because they are not manufactured is difficult to accept in the light of what we know about personal ornament use in past and recent human societies and in light of the results presented here. A number of archaeologically recognized beadworking traditions are exclusively or almost exclusively represented by marine shells. This situation is observed, for example, at the beginning of the Upper Paleolithic in the Mediterranean region (10, 11). As in North Africa, a single perforation bearing no other compelling evidence of human intervention is the only modification observed on the vast majority of Upper Paleolithic shell beads. Many ethnographically documented beadworking traditions exclusively use unmodified beads or minimally modified elements of the natural word (feathers, shells, bone, teeth, etc.) (42). Whether used in isolation or integrated into complex arrangements, ornaments made of slightly modified natural objects often represent, by the direct link they establish between the natural world and the meaning attributed to them, quintessential symbolic items. A peculiarity of these objects is that when available only in distant regions, their acquisition depends on organized exchange networks, and value is ascribed to their possession. 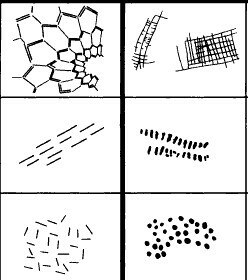 Such networks are instrumental in the trade of other items, as well as genetic and cultural exchange. It is striking in this respect: three of the Moroccan sites yielding Na beads are located 40–60 km inland; the only site reported in Algeria, Oued Djebbana, is 190 km from the sea; the number of recovered beads is often relatively small; and at Taforalt unperforated shells are also documented. This pattern is precisely what one would expect if the presence of Na at inland sites was the archaeological signature of networks linking coastal areas and inland regions. A supplementary reason for discarding the lack of manufacture argument is based on the observations presented here that suggest that MP shell beads were deliberately perforated. The anthropogenic origin of the perforations on MP shells has so far been inferred from the rarity in natural assemblages of the perforation types recorded on the archaeological shells and the results of experimental piercing of the shell (5) that produced, with some techniques, perforations comparable in location, size, shape, and position of microchipping to those observed on archeological specimens. The marks recorded on two Na from Taforalt confirm what was previously suggested based on the inner position of the microchipping, that is, that the perforations on these Na were made by vigorously punching the body whorl with a robust lithic point. Analysis of the amount, spatial distribution and degree of alteration by heating of other categories of burnt items found in the same layers (lithics, bone, and land snails) is necessary to verify the hypothesis that Na were intentionally heated to change their color. Identification of usewear posterior to heating indicates that intentional heating is a viable hypothesis that requires further investigation. The presence of pigment residues on many well-preserved shell beads from MP sites links bead and pigment use, further reinforcing the argument for their interconnected symbolic value (5). Intensely developed use-wear suggests beads were used for a long period although the length of use and the way they were strung remain to be determined. " 42,000 years ago – Ritual burial of a man at Lake Mungo in Australia. The body is sprinkled with copious amounts of red ochre. I.am.confused as to the burial of dead being a religious tradition. I would think nobody would like to see their friend or family member eaten by animals and bugs or decaying in front of them, burying them or burning them, especially in a group of any size would be common sense? I'm still digging in that direction myself, I don't fully grasp why these things are accorded religious significance, but they pretty universally are all across the field (or science, if you prefer) of archeological anthropology. I will say, that deliberate burial of the dead keeps scavenging animals away, some of which may also be predatory. When you are face to face with a wolf with barred teeth, whether he's scavenging or hunting is for that instant irrelevant to you. You just don't want to be there. We are all familiar with grave goods, and how kings have been buried with full armies and attendant staff and harems and all of the associated furniture and accoutrements...and why did they do this? To have these things with them in the afterlife. OK, makes sense, in the modern, historic, institutional religion sense. When you find a 100k yo burial with a boar mandible placed carefully across the chest, what does this mean? In my unstudied opinion, having not looked closely at this find, I would surmise the mandible was a weapon, and it was given him in death for protection in the afterlife. Why would he need it in the afterlife? More importantly, why did they believe there even was an afterlife??? Similar finds, though not nearly as old, are modestly frequent throughout the span we are speaking of, and the prevalence, amount and intricacy of grave goods and deliberate decoration seems to increase with time. I will need to follow up, but I seem to remember towards the end of the Ice Age, going to guess here from around 20k to 10k, that we start finding hair combs and clasps and buckles and ornaments that are more finely crafted as humans discovered and began using metals, especially copper and tin...which led to bronze and eventually iron. Some of these items are carved stone, and the act of decorating seems to become an indication of status...you have the free time and skill, or you have to be powerful enough to have others do it for you. The connection with religion particularly with the portable art and cave paintings I am convinced are a reflection of sympathetic magic. I am no practitioner, but what little I understand seems to correspond both with what we now call meditation and "think it, be it" style projective thinking in combination with the previously mentioned induced transcendental state of mind. In looking up the Golden Bough for the other thread (which I have read the abridged version) I found that work has had a profound influence on anthropology in this regard, so it may be a somewhat knee jerk presumption on the part of the researchers, but not without some degree of merit. I won't know until I can find source papers discussing the matter, and so far I have come up empty handed, but I've only tried a couple times. 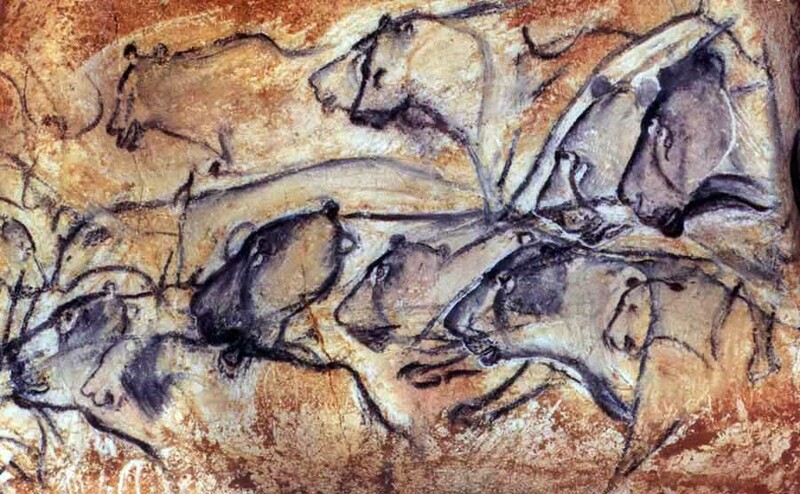 Humans have been painting caves for tens of thousands of years. It all started back in the European Upper Palaeolithic, around 35,000 years ago (and continued throughout that period). But what motivated them to start drawing in the first place? A lot of effort has been spent trying to figure that out. Sadly we haven’t found a definitive answer, but there are many good hypotheses. Here are the top three. 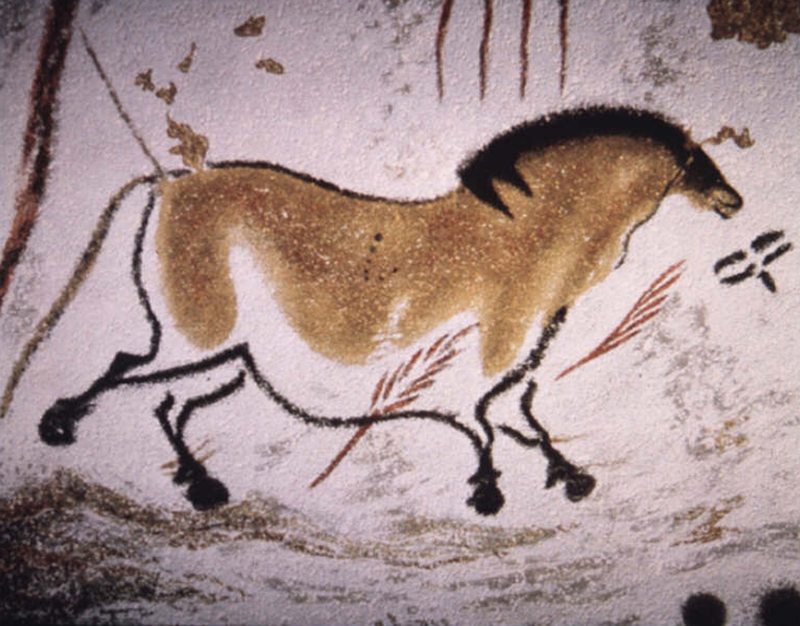 One of the earliest explanations for cave art is “arts for art’s sake”. This was first proposed back when these images were originally discovered in the 19th century. As the name implies, the idea is that our ancestors just did it because they were bored. Because they found the pictures pretty. Because they wanted to. There was no real goal behind it, it was the prehistoric equivalent of a doodle (Bahn, 2008). So what do archaeologists do when they don’t know quite what something is? Claim it’s part of a ritual! Which they did, suggesting that ceremonies were conducted in these caves and that the artwork was the result. There is quite a bit of evidence in support of this hypothesis. 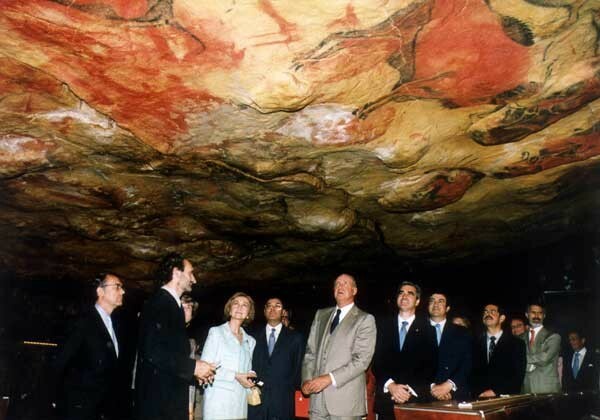 For example, many caves – such as the famous site of Chauvet – were never inhabited by people, being used only for art. Perhaps these were sacred locales (Zorich, 2011). Further, many of these sites all have a particular orientation, much like many later buildings of ritual significance (Hayden and Villenueve, 2011). Others have proposed other ways in which cave art might be ritualistic. For example, Bednarik (2008) pointed out that many of the footprints found in caves were made by children, and the size of some of the hand stencils also match the size of a kids hand. Based on this he suggests the art was part of some kind of “coming of age” ritual. Of course, not everyone has found the ritual idea convincing. Some have suggested that there was a more practical reason for the artwork. Mithen (1988) realised that the changing climate meant that many species could disappear from a region for a long time. He suggested that cave art was an attempt to keep a record of species seen before, preserving the knowledge of them for when they returned. This, he believed, explained why many images showed twisted feet (to record what tracks they made) and why they focused on the rarer animals, like mammoths. Studies of the art have shown that the animal drawings are very accurate; with the markings on the art aligning with reality. In fact, some of the drawings depicted spotted horses; which people always thought were a modern development. That is, until genetic analysis revealed there was spotted horses back in the Palaeolithic. Clearly these images reflect real animals. "(T)here is another aspect to this art that often escapes attention, but which is now providing scientists with fresh insights into our recent evolution. Instead of studying those magnificent galloping horses and bisons, researchers are investigating the symbols painted beside them. Their work has one other critically important aspect, however. Those strings of symbols seem to have been in widespread use 30,000 years ago, as modern humans spread through Europe, having finally seen off the Neanderthals. The question is: when did modern humans first develop and use them? Did Homo sapiens invent them after we arrived in Europe or do they have an even older lineage? Is it possible that our ancestors carried them out of their African homelands when they first began their global diaspora, about 70,000 years ago?" According to the article at this link, I'm a bit behind in my studies. Where I credited the long standing point of Sumerian Cuneiform as the earliest written language, apparently sometime in the last ten years or so that has been refuted. "We are now aware of the Vinca (Mother) culture which existed in Eastern Europe around 5,500 - 4,500 BC. The earliest examples of Vinca script were generally regarded as token or symbolic only however, following other discoveries with the same symbols in the region, it is now suspected that the Vinca script represents a proto-language similar to those from the Great civilisations that emerged a thousand years later in Egypt, The Middle East and in the Indus Valley. " It gets even better....apparently there is work underway that suggests this "Mother Culture" proto-language has its roots in the cave scribbles! If this can be definitively tied together, that would place written language back to somewhere between 20-30K ybp. The researchers are still sorting through deciphering what the symbols mean, but symbolic thinking apparently is quite old in humans. Nothing there!? Are you nuts.....Nothing!? The godlike entity of the major religions, (Allah,Upu,God,YHWH,Great Spirit or w/e) basically is the child of all humanity up until now, as an echo or response to all the suffering that our race were/are exposed to. We created such an entity that makes us feel safe through hope and a big fat shield of selfish love. Hence it requires faith which is the same as blind devotion and put your valuable trust in something that is not really answering. Anti desperation is the purest reason why religion exist without its corrupted features, sadly the ego that plagues our race and oxidated this perspective of religion over millennia. It's only through trace amounts of information and logic that i found this out that religion equals pure hope and was born through humanities godly feature which is also to create. As a living sentient being we want to survive first then after feeling safe enough we want to grow and give reason to your/our existence and eventually share your best version of you with others which brings pure bliss to oneself and others. Experiencing bliss or happiness if you will is the main goal of anyone that exist, even for a supreme god. It is the reason why creation once started, the goal of creation is to create and experiencing bliss. The reason why we as a sentient young race created gods or God? First to stabilize desperation due to the exposure of traumatic natural disasters and forcing an explanation what on that moment was plausible to form a sense of hope and thus a sense of safety and control. Needless to say eventually this led to mostly monopolizing the ego for the worse. The legacy of all lessons learned eventually formed the godlike entity our race needed for at-least hope. One day somewhere near or far in the future we do not ask for such a godlike entity for help but instead once we finally fed up of all past mistakes our race becomes it, which means have the same altruistic features as such a godlike entity. This all happens once we to stop asking and believing for a miracle help and grow some balls and be our own savior. thus behold, humanity past the test of all young sentient races trying to leave its nest, its ego. Now they can finally spread its fully developed wings and can now partake its healthy and fruitful journeys to aid the recovering of its ecosystem an spread life beyond Earth and perhaps if stable enough eventually encounter extraterrestrial life what leads to interstellar trade like in the days of the famed silk-roads.